On 31 March Royal Mail will issue new definitive stamps in advance of the change in postage rates which takes effect from 6 April. 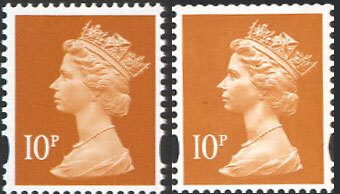 Of course these colours are Royal Mail descriptions so we can't be sure what they will actually look like until they show us, but the 17p is probably similar to the 18p & 30p, the 22p similar to the old 16p, red has been used a number of times (8p, 26p) and ultramarine is probably the 20½p blue. 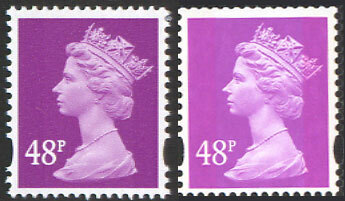 New 56p and 90p country definitives will replace the 50p and 81p in existing designs. Machins with security features: delays and cancellations! This range of books will now have a First Day of Availability on 31 March 2009, as opposed to 17 February 2009. The business sheets will now not be available until 31 March 2009, as opposed to 17 February 2009. Stamp rolls / coils of the Machin stamps with new security features will not be produced for this issue. 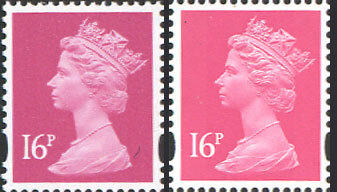 All other stamps and products for this issue remain unaffected. Well - that will make production of first day covers on 17 February somewhat easier. As with the Design Classics Prestige Stamp Book(PSB) Machins pane, the Charles Darwin PSB has some surprises, especially as the PSB stamps are printed by De La Rue as the ordinary counter sheets are. I don't think we've had a 5p - or indeed any Machin - quite this colour before! 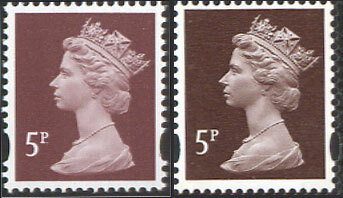 The Machins from the Darwin PSB are printed by De La Rue in litho and are shown on the right. (The normal sheet stamps in gravure are on the left). Remember these are simultaneous scans: if the 'old' stamps don't look like yours, make some allowances for your monitor and my scanner! The new ones are still different. 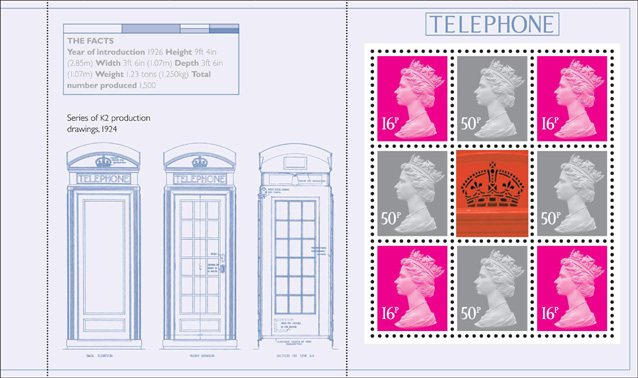 The UK has produced some of the world's most iconic design work of the 20th Century and the 2009 Special Stamp Programme starts with a celebration of ten British design classics. 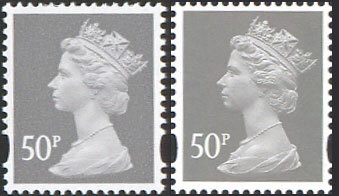 These stamps, together with a prestige stamp book, a presentation pack, first day covers and stamp cards, will be on sale on 13 January 2009. Classic design included the distinctive lines of RJ Mitchell's Spitfire fighter and the stylish chic of Mary Quant's daring mini skirt, the calm of the Penguin Books jacket and the practicality of Robin Day's Polypropylene chair. But one brilliant design remains close to millions of people's hearts - the Mini car. In 1959 the first Minis rolled off the production lines at the British Motor Corporation's plants at Longbridge, Birmingham and Cowley in Oxford. Designed by Sir Alec Issigonis, the revolutionary small car remained in production until 2000 and is the most popular British designed and built car ever. Not only that but its stylish design made it a hit with the trend setters of the swinging sixties with everyone from John Lennon and Marianne Faithfull to Peter Sellers and Steve McQueen owning one. Minis were also a key element in the hit film The Italian Job. On the same day Royal Mail will issue a Smilers Sheet of 20 mini-car stamps with attached labels depicting moments from the iconic small car's history and some of its many variants. 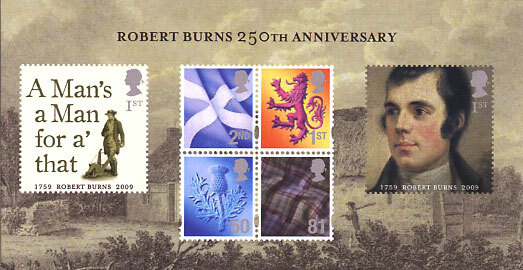 See the sheet and the special postmarks for the day of issue on our website.